The action camera and drone maker saw its share price tumble again last month as its challenges continued to mount. The tough times continued last month for GoPro (NASDAQ:GPRO), and shares of the action-camera maker fell 13%, according to data from S&P Global Market Intelligence. Though there was little specific news out on the company, investors reacted to fears that it was having a weak holiday season, the aftermath of layoffs announced at the end of November, and a slew of lawsuits against the company on behalf of investors. 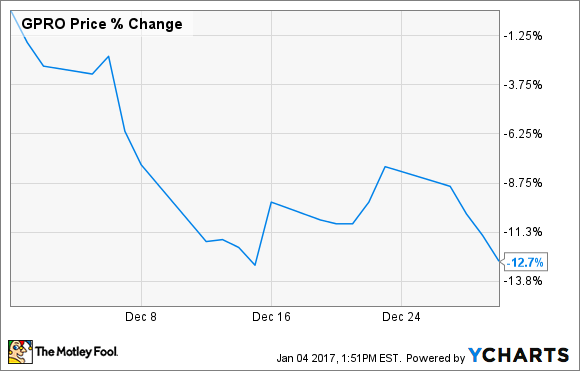 GoPro's stock slide last month should be seen in the context of its greater struggles: The device maker had an awful 2016 as both revenue and profits plunged, and the stock lost 52% of its value. On Nov. 30, the company said it would lay off 15% of its workforce and close its entertainment division, a response to declining sales. Offering a bit of good news, it said that camera unit sales were up 33% over Thanksgiving weekend, but the company also had to recall all of its recently released Karma drones due to an issue that can cause them to lose power in mid-flight. In sum, a number of self-inflicted wounds have led to these share price woes. As yet, there have been no specific reports on its holiday sales, but investors punished brick-and-mortar retailers such as department stores on reports of weak traffic and heavy discounting, while Amazon.com seemed to win the holiday season. In October, GoPro said it would stop selling its new Hero5 on Amazon, likely due to a pricing dispute. Looking ahead to 2017, GoPro's holiday numbers will be crucial to determining its early direction; its gadgets are heavily gifted items, and the fourth quarter has traditionally been its strongest period. Those results could come out within the next week or two, and the company could desperately use the momentum of a healthy holiday season. Elsewhere, solving its drone problems could unlock another valuable segment growth since even action cameras are becoming increasingly unnecessary as the iPhone and other smartphone cameras make significant improvements. A buyout also remains an option for the company, given that, though its stock is floundering, its brand name is still strong.